Enjoy the most romantic days of your married life with this special Singapore getaway package.Singapore is a small yet enormously attractive Southeast Asian destination,made up of everything from the inimitable urban charm, cultural sights, and mind blowing serenity to bountiful of leisure, shopping and dining choices.Evidently, the place has the perfect concoction to ensure the utmost marital bliss. So come and have some unforgettable moments with your beloved one amid the most passionate and spectacular setting! Offering the finest comforts and experiences in five nights, your Singapore honeymoon trip kicks off with a well-rounded city tour. See all main attractions including OrchardRoad, Suntec City, Fountain of Wealth etc, and don’t miss to capture some great pictures together with the mythical creature of Merlion in the backdrop, as youstop off at Marina Bay. You’ll also get to absorb the atmospheric charm and everlasting allure of Chinatown and Little India. Add to your romantic outing in Singapore by taking a ride in one of the world’s largest observation wheels, Singapore Flyer. As you revel in a 30-minute spin on one of its 28 air-conditioned glass capsules, be enchanted by the most refreshing and magnanimous Singapore sights that envelop both of you at a height of more than 165 meters. Want to take your sky-bound romance to new heights? Speak to our team who will upgrade the Flyer experience, allowing you to dine on your own private capsule with just two of you! Another highlight that makes your honeymoon really memorable is River Safari, which not only lets youto survey an amazing and rare collection of river creatures but also delight in many attractions themed around some of the world’s popular rivers. 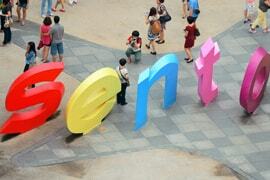 Lastly,catch up with all adventure and fun that await both of you on a half day Sentosa Island tour. Experience the island’s main sights like Merlion Statue from an exquisite vantage point on a cable car ride, besides exploring Madam Tussauds exhibits and enjoying Wings of Fire. We picked this Singapore tour package for our honeymoon as it gave us some interesting tour options. The hotel we picked was stylish and at the same time comfortable. All our transportation, including airport transfers, was managed well. Moreover, the tours were organized well too. We enjoyed going around the city and the River Safari. However, the Sentosa Island tour was definitely the best. We look forward to more holidays with Rayna Tours in the future. The honeymoon Singapore tour package was amazing. We had a really good time in the city. 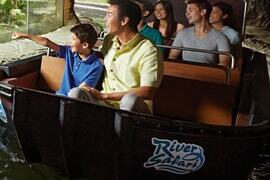 My husband loved the River Safari and Sentosa Island tour, while I liked the city tour the best, especially the tour of the Singapore Flyer. We got to see the neighbouring country of Indonesia from the Flyer! The 5 days we spent in the city were great. We thank Rayna Tours for this memorable holiday!